This is a line-up of all my canning from this fall, so far. 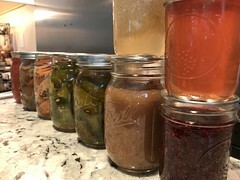 From left: tomato sauce, End-of-the-Harvest pickles (Ball book of canning), Daikon and Carrot pickles (Food in Jars), Bread and Butter pickles (Food in Jars), Sandwich pickles (Ball), Apple Sauce (Food in Jars), Raspberry Jam (Ball). And on the top: Apple Preserves and Crabapple jelly (both from the Ball book of canning). wow. that's amazing. and inspiring too! 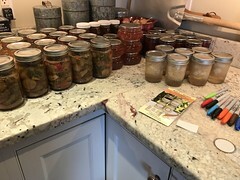 especially since learning how to can/preserve is my goal for next year now that my garden is bigger and able to produce more! you must feel proud of all your hard work when you see it all together like that! Your work looks tasty and pretty! I have the Ball book, several iterations in fact, how does the Food in Jars book compare in your opinion? Food in Jars doesn’t really compare with the Ball book. It has a small selection of very nice recipes and beautiful photos. The Ball book has at least 10 times more recipes with lots of variations. I don’t think it has photos. I find the two books complement each other very well. 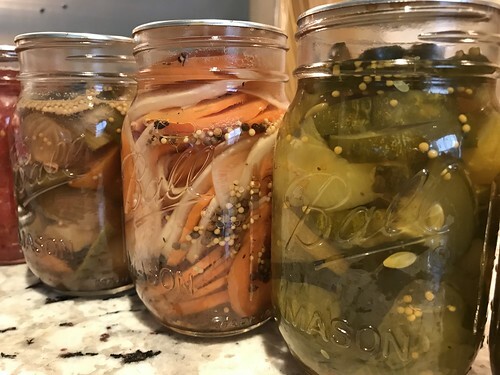 If I want to make something and Food in Jars has a version, I’ll go with that. If they don’t, then Ball will always have a basic version.